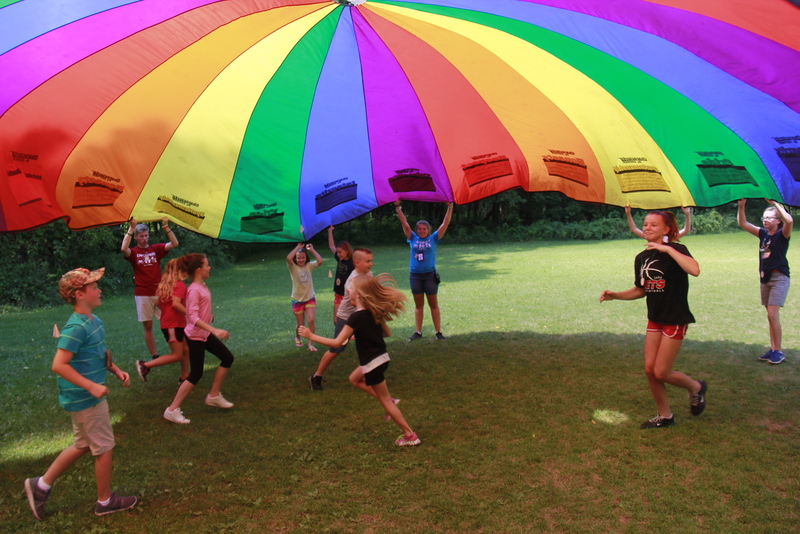 ####Last Call This afternoon campers had one last chance to have some fun at Camp Lakewood this week. 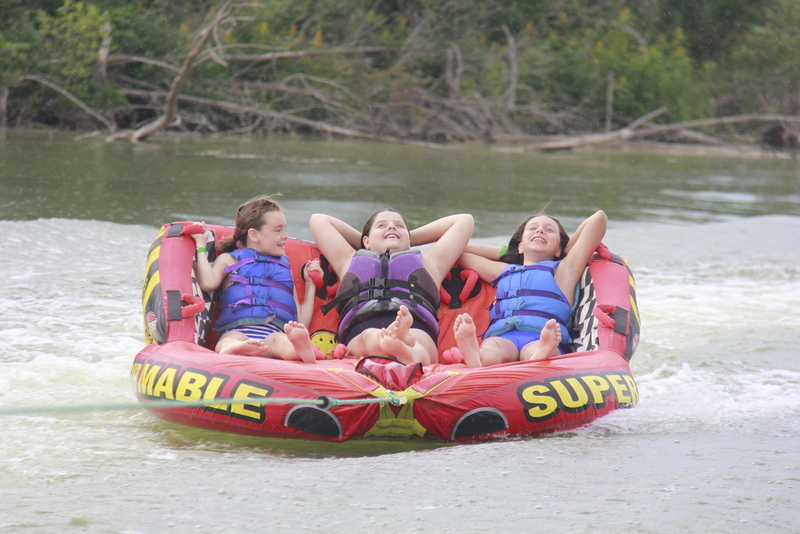 They did things like learn about nature and go tubing. ####Lunch Lunch this afternoon was a cookout at the beach! We had hotdogs, chips, carrots, and baked beans. ####Morning Fun This morning the campers had the opportunity to have some more fun on things like the AquaGlide, the swing, and the climbing wall. ####Discovery Time Campers this morning learned about the Bible story of "The walk to Emmaus" and how Jesus showed up to two ordinary people on the road who were talking about Jesus dying on the cross. When the men came to their home, they invited Jesus to stay with them since it was getting late and when Jesus took the bread and broke it, the men's eyes were opened and they realized that they had been with Jesus all along. 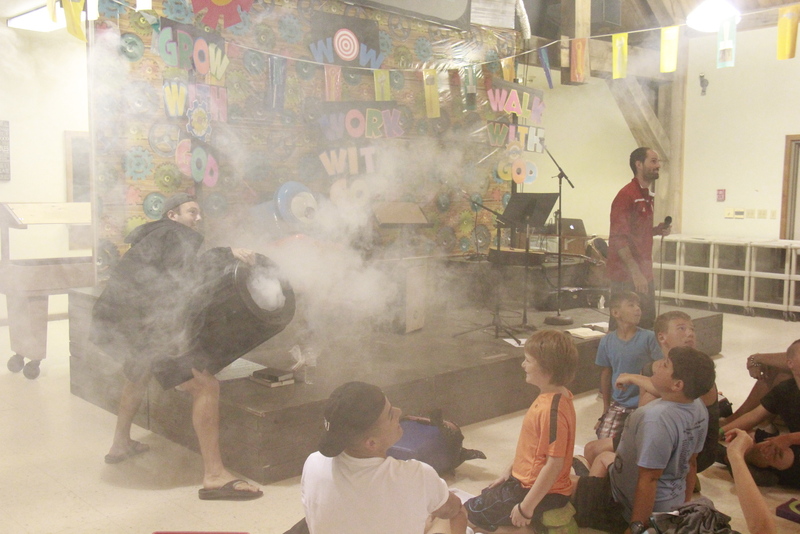 The campers had a demonstration with trashcans and a fog machine. To start with they took the trashcans that had a hole in the bottom and were covered on the top. They hit the top to feel the wind from it and then they filled it with fog from the fog machine and then hit it and they could see the "wind" to show that at times when you can't see God around you that he is still there no matter what. Breakfast this morning was breakfast pizza, cinnamon breadsticks, grapes, and cereal. Tonight the campers worshiped to Lord I need You, Great are you Lord, Good Good Father, and Forever Reign with their hands raised to God. Tonight was commitment night for the campers. 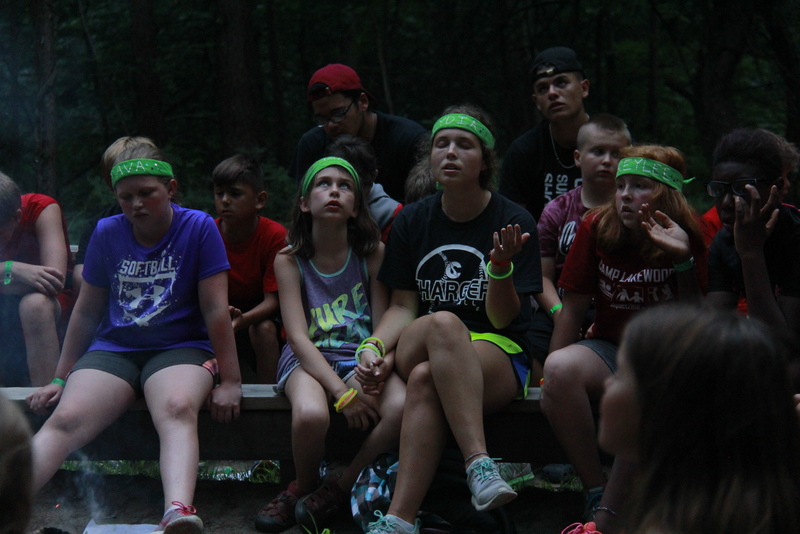 They had the chance in their cabin devotion time to ask God to be in their life. They learned tonight that they are all tools to help build God's kingdom. They learned that even if something bad happens to them that God is still there for them and as present as ever. Tonight the campers engaged in some friendly competition in games like a three legged race, a giant puzzle, and tug of war. Dinner tonight was pizza, breadsticks, broccoli, and cheese to go with the breadsticks and broccoli. This afternoon campers had the opportunity to go tubing, climb on the rock wall, and shoot some arrows at archery. At the rock wall the campers overcame some fears about the height of the wall but they remembered that God was always with them. Make sure you check out the rest of the photos here! Lunch this afternoon was sloppy joes, chips, salad, and applesauce. The campers this morning were challenged at the swing this morning because some thought that it went a but high, but they ended up loving every second of it. At discovery time this morning campers learned about how Jesus fed 5,000 people. They learned that a little boy shared is lunch of 5 loaves of bread and 2 small fish, but Jesus prayed over the food and was able to feed all of the people and still have leftovers. They did a science experiment and made elephant tooth paste to show how unexpected this can be. Then people listening to Jesus didn't expect to be feed till they were full but they ate and ate. 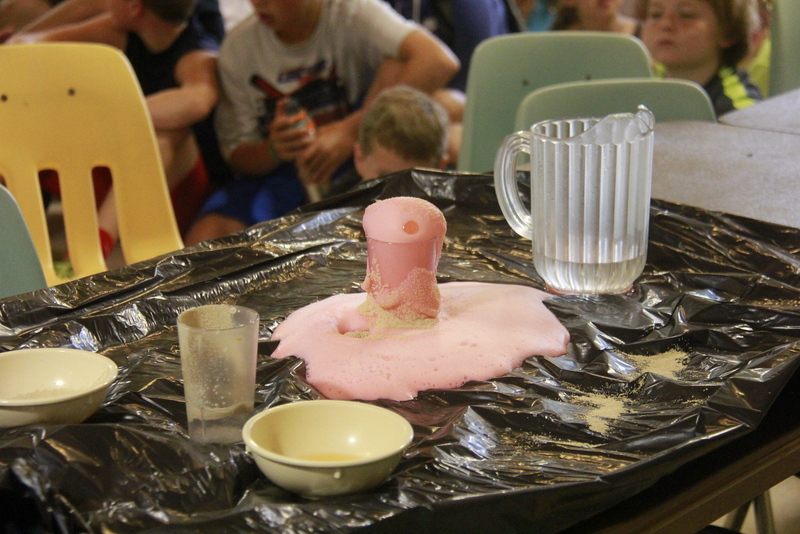 The campers didn't expect the science experiment to go as it did. The campers were challenged this morning to wonder at God and all of the things He created and how is God working in their lives. Breakfast this morning was biscuits and gravy, triangle hash browns, and cereal. Tonight the campers sang Lord I need You, Great are you Lord, Good Good Father, and Forever Reign. Another one of the counselors shared part of their story and how they experienced a miracle in their life. They talked about how even though they haven't had a huge miracle, miracles can be anything. They shared how their miracle was that they never had to set an alarm, they always woke up at the right time. This evening for evening extravaganza was wacky water relays. The campers had tons of fun in the relays while getting soaked. Dinner tonight was chicken strips, potato wedges, cooked carrots, salad, and dirt pudding. Campers this afternoon had the opportunity to go swimming, zip lining, and be on the adventure trail. They had lots of fun on the adventure trail learning to work together. Lunch today was corndogs, Mac n cheese, salad, and applesauce. 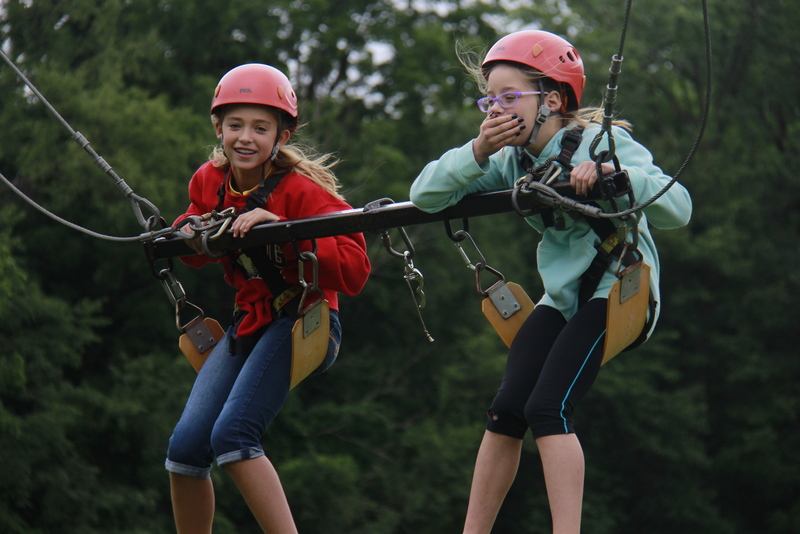 This morning campers had the opportunity to go on the swing, the AquaGlide, and the zip line. This morning the campers learned about the Parable of the Mustard Seed. The learned that parable are a story with a hidden meaning. In this parable, they learned that the mustard seed represents our love or our faith in Jesus and how over time that seed grows and overtime our love for Jesus grows and we grow in our faith. The mustard seed may start out small, but it grows to be the biggest garden plant ever. 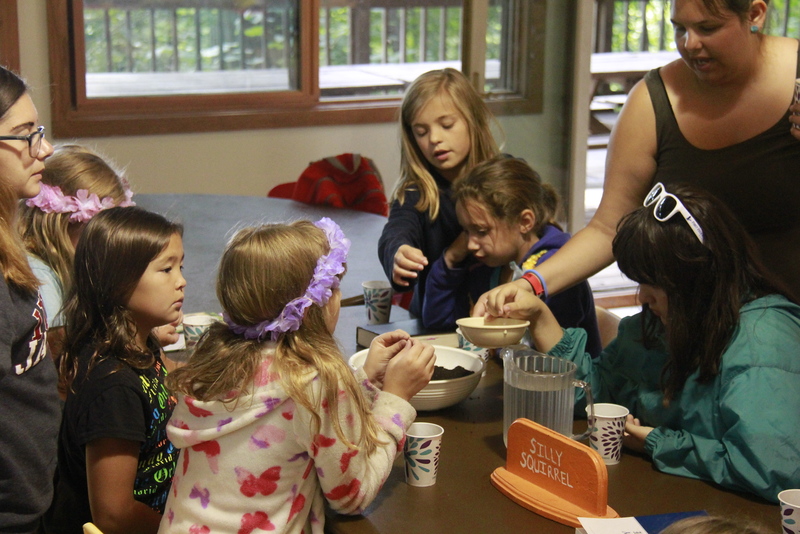 The campers even had the chance to plant a seed in a cup to take home and watch them grow as they grow spiritually. Breakfast this morning was French toast sticks, crispy potato cubes, sausage, and cereal. Tonight at Vespers we sang Lord I need You, Great are you Lord, Good Good Father. Another one of the counselors shared part of their story and they talked about how God will always be there for us and how He is a good father to us. They talked about how we should build strong relationships with others around us especially with God. We have a wonderful heavenly father who we can always rely on. Tonight the campers engaged in a giant game of hide and seek with the staff. The staff hid all over camp with points and the cabins divided and had to find the staff. 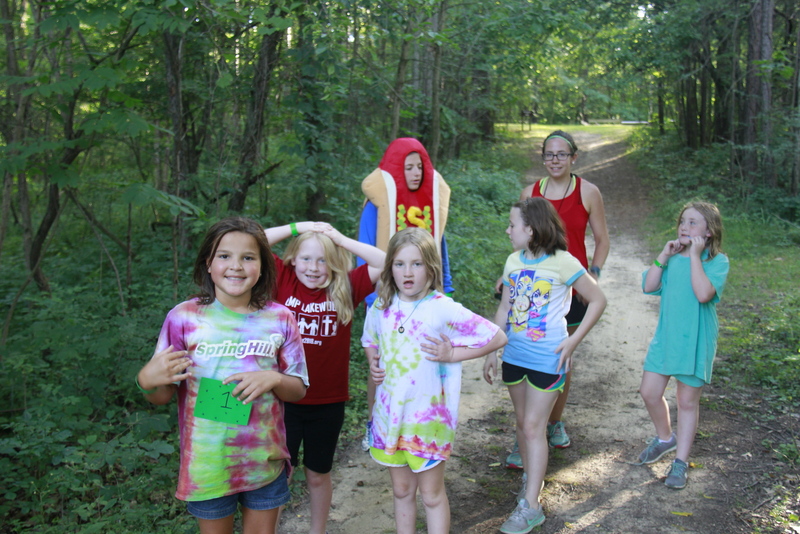 The campers had tons of fun running after the staff to get their points. Dinner tonight was chicken drumsticks, french fries, corn, salad, and yellow cake with frosting. This afternoon campers had tons of fun at things like the zip line, tubing, and the climbing wall. Lunch this afternoon was tacos, nachos, and churros. This morning campers engaged in activities such as wilderness and the swing. They are having lots of fun at camp and looking for things to praise the Lord about. This morning the campers read from Ezra and learned about the rebuilding of the temple and how they shouted for joy and kept praising the Lord. Breakfast this morning was eggs, bacon, and cheesy hash browns. At Vespers tonight campers sang Great are you Lord and Lord I need You. One of the counselors shared part of their story and how they turned to God when they were going through a hard time just like Esther did. The counselor shared with the campers the equation e+r=o (event plus response equals outcome). For tonights evening extravaganza the campers participated in messy games. One of the activities they did was a crazy hair contest with shaving cream. They had tons of fun playing silly games. Dinner tonight was lasagna roll-ups, breadsticks, salad, and chocolate chip cookies. 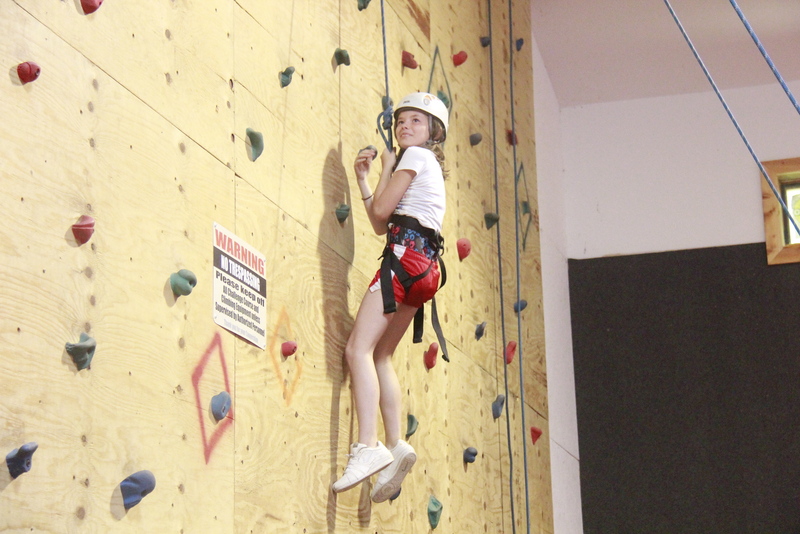 Campers this afternoon had the chance to go to the climbing wall, swimming, archery and the nature center. 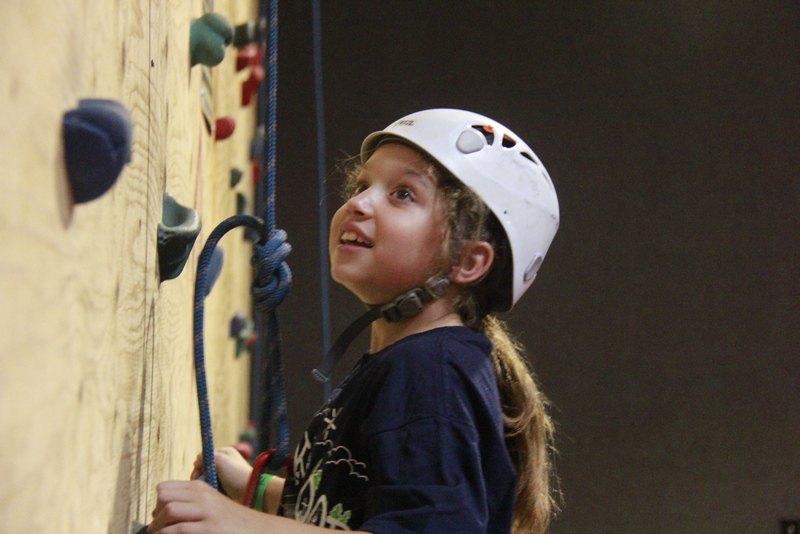 At the climbing wall, they learned that with God's help they were able to have the strength to climb to the top. Don't forget to check out more of the photos! Lunch this afternoon was breaded chicken sandwiches, tater tots, pears, and salad. 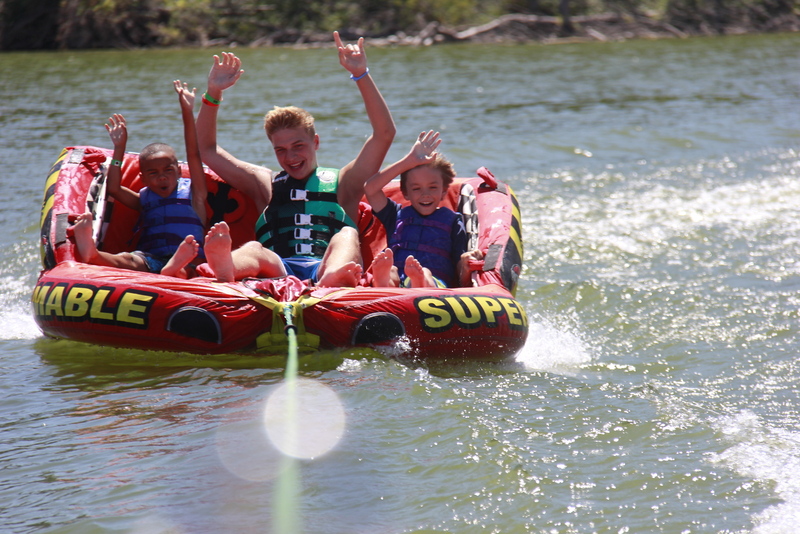 This morning campers had some fun at the swing, AquaGlide, and zip line. At the swing, they talked about how they didn't need to be scared because God was always going to be with them and to keep them safe. Today's theme is Imagine with God and they learned about Esther from the book of Esther. They learned how she imagined with God to tell the King about an evil plan that she had heard about. Breakfast this morning was waffle sticks, triangle potato hash browns, and cereal. Campers tonight experienced a glimpse of what Vesper Hill will look like for the rest of the week. They learned about the things that will happen while they are there and how Vespers is a holy place and that God can do wonderful things. They talked about the Workshop of Wonders or WOW and how wonders can mean two things. One meaning of look at this cool thing that I did today at camp or I wonder why people raise their hand while singing. The song they sang at Vespers tonight was Good Good Father. Tonight the campers enjoyed games and the swim test! Dinner tonight was hamburgers, french fries, peaches, and salad. Check-in went great and campers are already having tons of fun!